Hi friends! 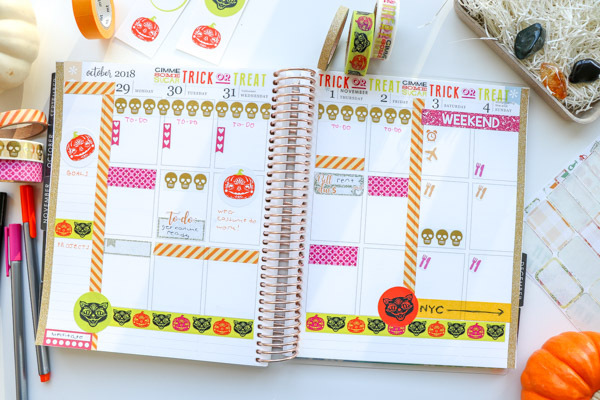 This post features a GLAM-O-WEEN planner decorations look. Yup, it’s a orange, black, green, with pink and gold accents. Traditional colors with some fun elements. This is what’s so great about planners – you just have fun and play. And who couldn’t use some more play in their lives? This look is colorful while still leaving plenty of writing space. And I filmed a Plan-with-Me video to show you how I put this layout together. Planner supplies are linked at the end of this post. Oh and if you’re looking for last minute decorations – this is a great option because you can purchase the key materials at your local Paper Source. Note: This post contains affiliate links. If you make a purchase from one of these links, I may make a small commission at no extra charge to you. I use and love the products and shops linked. Please feel free to reach out if you have any questions. Whenever I start decorating my planner, I start with an inspiration piece. In this case, I used this mini washi tape set and stickers by Paper Source. After that, I added coordinating washi tape, Etsy stickers, and color pen writing to maintain the color scheme throughout the spread. 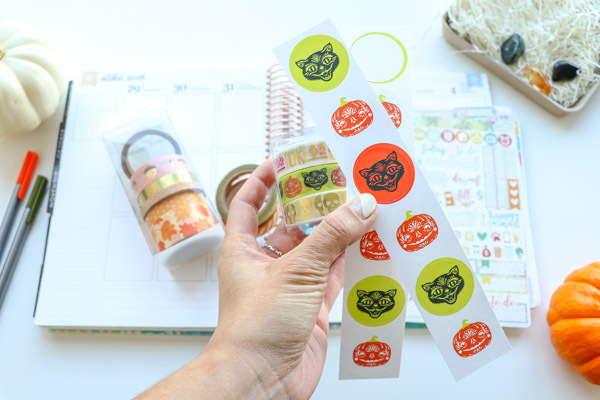 I used washi tape and some of the sticker kit I used in this fun fall “Sweater Weather” Plan with Me video & post. When I want my planner decorations to be extra colorful, I’ll add extra pieces of washi tape in the tops and/or bottoms of the vertical day boxes. Now that I’m using multiple planners, I’ve found that I don’t need quite as much writing space, so this allows for more decorations! On this layout, I’m using the left column to track Goals, Projects, and a habit of meditation. Some of the stickers were sold out when I went to find links for you, so in some cases, I’ve linked similar items below. Thanks so much for reading and watching! 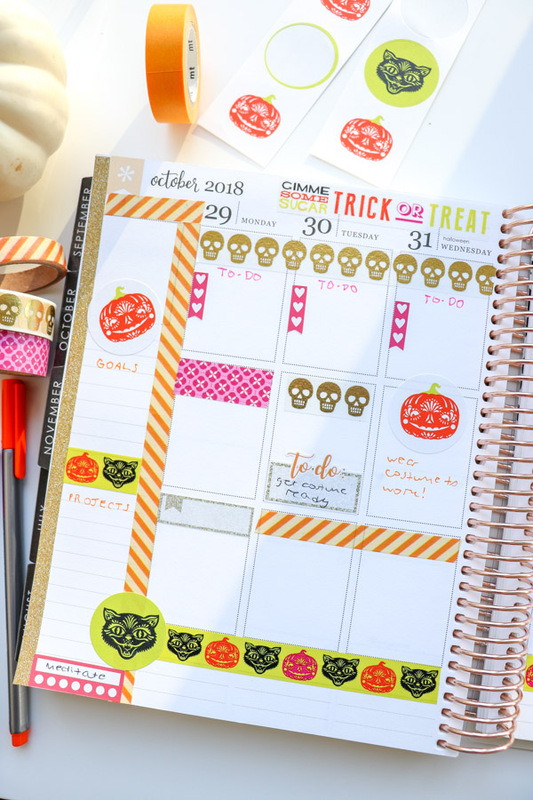 Hope you liked this Glam-o-ween Plan with Me: Halloween Pink And Glam | Erin Condren Vertical LifePlanner 2018. Cheers!